Reading and share top 14 famous quotes and sayings about Distancing by famous authors and people. Browse top 14 famous quotes and sayings about Distancing by most favorite authors. 1. "The sea was cruel and selfish as human beings, and in its monstrous simplicity had no notion of complexities like pity, wounding, or remorse... You could see yourself in it... while the wind, the light, the swaying, the sound of the water on the hull worked the miracle of distancing, calming you until you didn't hurt anymore, erasing any pity, any wound, and any remorse." 2. "The aspects of patriotism that hush dissent, encourage going along, and sanction comfortable distancing and compliance with what is indecent and unacceptable... those aspects are too fundamental to ignore or gloss over." 3. "Maybe the key to moving on was distancing herself from Wes. Not all the way. Just a little bit.Enough to let someone else in." 4. "The paradoxical virtue of reading lies in distancing ourselves from the world so that we may make sense of it." 5. "The anarch sticks to facts, not ideas. He suffers not for facts but because of them, and usually through his own fault, as in a traffic accident. Certainly, there are unforeseeable things – maltreatments. 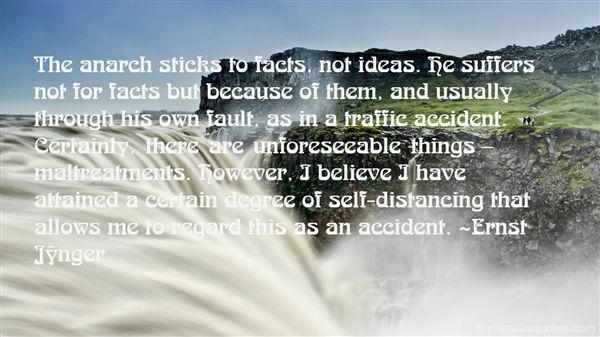 However, I believe I have attained a certain degree of self-distancing that allows me to regard this as an accident." 6. "I assume that in great men whose names I dare not mention, the anarchic element was very powerful. You see, when fundamental changes are to occur in law, custom, and society, they presuppose a great distancing from established principles. And the anarch, should he take any action, is capable of working this lever." 7. "Again, as it was after Udayan's death, there was an acute awareness of time, of the future looming, accelerating. The baby's lifetime, so scant, already outdistancing and outpacing her own. This was the logic of parenthood." 8. "...people demonize certain types of crime - it's a way of distancing ourselves from the monsters..."
9. "Inverted commas (or speech marks, or quotes) are sometimes used by fastidious writers as a kind of linguistic rubber glove, distancing them from vulgar words or clichés they are too refined to use in the normal way. This 'N' character in Iris Murdoch's novel evidently can't bring himself to say 'keep in touch' without sealing it hygienically within inverted commas, and doubtless additionally indicating his irony with two pairs of curled fingers held up at either side of his face." 10. "Philosophy is a distancing, if not debilitating, activity." 11. 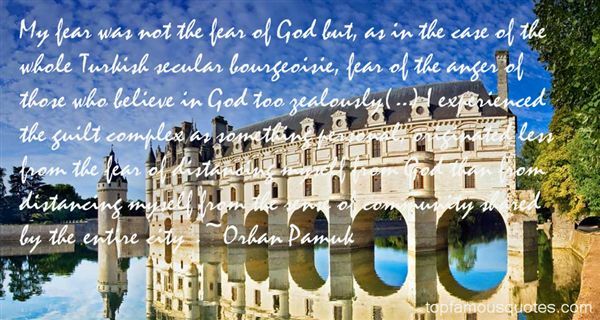 "My fear was not the fear of God but, as in the case of the whole Turkish secular bourgeoisie, fear of the anger of those who believe in God too zealously(...) I experienced the guilt complex as something personal, originated less from the fear of distancing myself from God than from distancing myself from the sense of community shared by the entire city ." 12. "Fairy tales had been her first experience of the magical universe, and more than once she had wondered why people ended up distancing themselves from that world, knowing the immense joy that childhood had brought to their lives." 13. "Few Iranians these days go through the fiction of calling themselves 'Persian.' 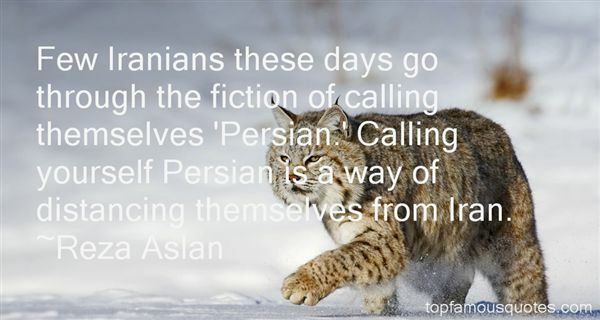 Calling yourself Persian is a way of distancing themselves from Iran." 14. "Too much detail can have a distancing effect"
History teaches that the level of unemployment is not as important as whether the rate's going down."